1. Go to your desktop and press the Print Scrn key (located on the right side of the F12 key). 2. Open a graphics program (like Picture Manager, Paint, or Photoshop) and doing a Paste (CTRL + V). 3. Post the picture on your blog. You can also give a short explanation on the look of your desktop if you want. You can explain why you prefer such a look or why it is full of icons. Things like that. 4. Tag five of your friends and ask them to give you a Free View of their desktops as well. Cool! I'm off to see it soon. I was naughty and downloaded it. I can't wait until July! Ah, that's a nice going away present! I could have got free tickets to the Spice Girls as McAlpine have a box at the O2, but I'd rather gnaw off my own leg. Spice Girls? I'd gnaw off your other one if you ever said you'd go! Even if I'd wanted to go (absolutely not! ), my cred would never recover. I still have to pretend I never went to see Curiosity Killed the Cat (not my choice, but I still went, I might add). Yeah, I've been annoying Mink for awhile now. There's a few people I recognise reading SPN. It's kind of the best of both world's, isn't it? It's not my favourite story of hers, as I think she tends to write Alec a little too naive, but it's still a treat. I can't wait for them to get back to Seattle and for the universes to mix it up a bit again. It's kind of the best of both world's, isn't it? it is. Alec is huge mixture, so aware in some ways and not in others. Yeah, I feel she writes him as perhaps he should have been rather than was. I'd like to write some Dark Angel one day, I think that universe is an absolute goldmine of juicy issues waiting to be explored (that the show itself spectacularly failed to address), it's just a shame I have no ideas whatsoever. I have some SPN ideas, although not fully formed ones. The problem I have with SPN is the same one that prevented me from ever writing a BTVS road trip fic - I just don't know America. I can fake it for a bit in a fictional town, but the way I see it, the country is as much a supporting character as Bobby or Ellen or the Impala and I've never been further West than County Waterford! I sometimes think I am insane to struggle uphill writing for a series set somewhere I have never been. having US, very patient beta readers has been the only saving grace. Even Torchwood, I know how much you like that, but, my point, South Wales, wholly different to here, one can take this not knowing to the nth degree if one starts. There's a fifference to writing about South Wales to writing about say New Orleans. You might not know the area, but you know roughly what it's like, the shops you might find, the culture the people have grown up with. Even something as simple as going into a shop and buying a drink is difficult to write about when you're unfamiliar with the brands. still the S Wales thing though, the slang is different, the Welsh is different, it's almost like the more you know, too much is also a stumbling block...I think too much. I hate animated movies. I'm horrified because my husband always insists on going to see them, and I'm dreading this one. I don't think you realize it--you've been infected with some hideous mind-bending virus. There's no other conceivable reason to like an animated movie. I pray you'll be restored to health soon. 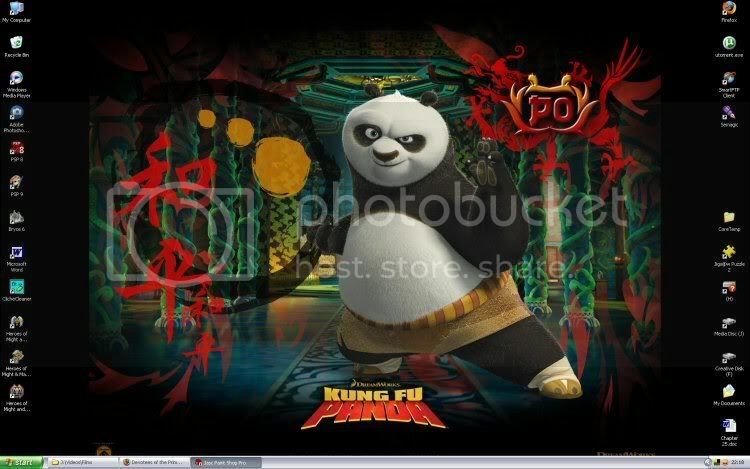 I am going to have to watch the trailer for King Fu Panda because everyone keeps talking about and I have no clue! What more do you need to know? The title says it all!